Poly Key Tags – Survivor Style – A Tough Tag with a Nice Price! Poly survivor tough key tags for all your key tag identification needs. The All new Survivor Key Tags are made of indestructible waterproof polyethylene. These key tags are 1.5″ wide by 3″ tall , fade proof, and won’t tear at the ring. A tough tag with a nice price! Rounded corners and holes on the top and bottom. Round corners won’t catch or tear pocket linings. Made of indestructible, waterproof polyethylene. The most durable key tag on the market. Wont tear at the holes. Key tag is 1 1/2″ wide x 3″ tall with holes in the top and bottom for custom orientation. 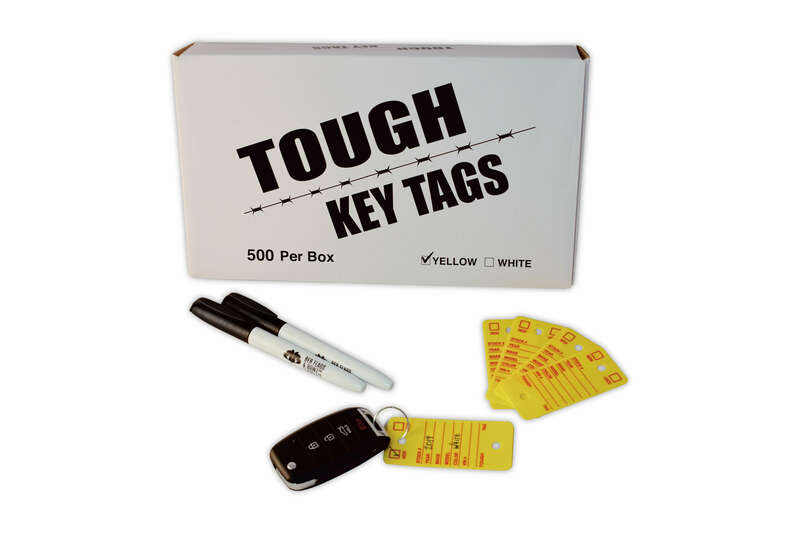 These poly survivor tough key tags come in eye catching yellow and easy to read white. You wont find a better price, guaranteed! Car dealers, automotive repair shops, RV lots, motorcycle shops, and more all agree the Poly Survivor tough Key Tags are the answer for car identification. 1000’s of happy customers every month. CARBOWS.US is a premier car dealer and real estate product provider. We carry jumbow car bows, self laminated round corner key tags, reusable balloon clusters and many custom flag products. Don’t see what you want here? Email us at orders@carbowz.com and we may be able to order it for you with our BEST price guarantee. If you have questions or would like to inquire about bulk pricing email us at orders@carbowz.com, expect a response back same day!